Las Vegas, NV, April 21, 2016 - CloudNcode Inc. of Saint John, New Brunswick and Dimension, Inc. of Las Vegas, Nevada today announce that they have signed a licensing agreement to use the patented Dimension fractal upscaling technology in a cloud-based video processing solution capable of delivering the precise finished video product its customers require for their needs, including advanced filtering, compression, upscaling and more. CloudNcode Inc. is pleased to offer Dimension’s Fractal Upscaling in its distinctive modular video transcoding infrastructure. CNC’s Cloud Platform employs specific pre-processing that delivers lower compression ratios while maintaining a high level of structural similarity to the source material. Together with Dimension’s advanced upscaler, clients will benefit from upscaled content unlike anything currently being offered in the marketplace. “Whether providing new revenue opportunities for older SD content or significantly reducing file sizes and costs of hosting and streaming, this new relationship with Dimension adds new value to what we offer our customers,” says Greg Abrams, President of CloudNcode Inc.
Dimension Inc. is proud to announce the first use of its upscaling solution in a cloud-based environment. Larry Panik, CEO of Dimension Inc. said, “We at Dimension are excited to see our advanced upscaler used in this integrated video processing solution that the industry has long needed. 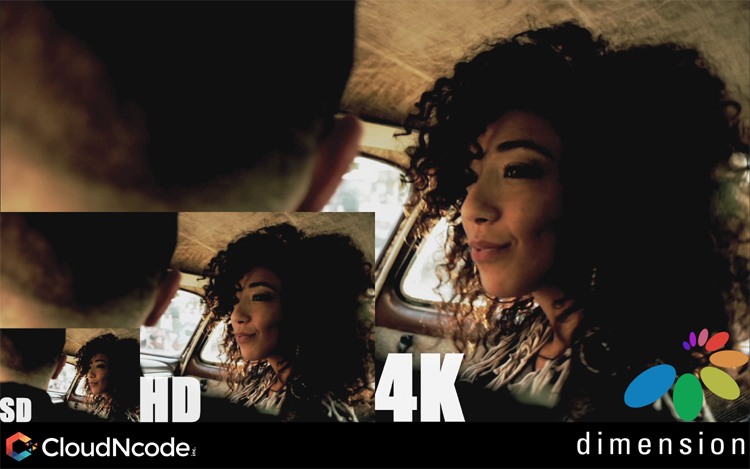 Our patented processes, including our Aspect Ratio Conversion (ARC), will enable the highest possible quality results, whether converting SD to HD or HD to 4K and beyond." CloudNcode Inc. is a provider of both managed encoding services and online subscription accounts utilizing its proprietary and robust Cloud Encoding platform. With a strong focus on better quality at smaller file sizes, CNC provides discerning clients quality results. Dimension Inc. is a technology licensing company with products based on our patents in both video compression and upscaling.